For September & October I’ll be giving away two separate BRCA Genetic Screenings (for you or your friends/family)!!! As we near September and October (Ovarian and Breast Cancer Awareness Months) I wanted to do something BIG to raise awareness …. something that makes sense coming from me. 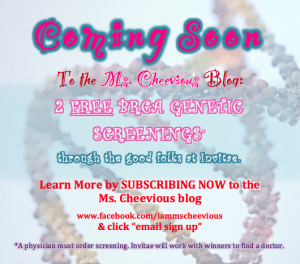 As a BRCA positive previvor, (and having had no cancer) these cancers affected me in ways that may differ from others’ experiences… THAT SAID — all of September and all of October, I’ll be holding a contest on my Ms. Cheevious blog offering TWO FREE BRCA GENETIC SCREENINGS from Invitae (a genetic screening company) to one lucky person each month (of course, their doctor must order the screening, and everything else has to align – the need for the screening, the medical basis for it — and Invitae will work with the winners to find a doctor in their area). Again, one winner in Sept and one in Oct!!! Stay tuned for the actual contest details, so you can share it with your family and friends. I will know soon if we can allow transfers… so if you win, you can gift it to someone in need. You can also subscribe to the Ms. Cheevious blog to be one of the first to get in on the action. It will be a Raffle Copter, so people can to enter daily to increase their odds of winning. ****ALSO IMPORTANT**** If you know of other companies who would like to offer related 2nd, 3rd or consolation prizes as a part of these campaigns, please let me know!